Sarah Morgan introduces a new trio of books in her popular From Manhattan, with Love series with New York, Actually, the story of Daniel Knight, the eldest of the three Knight siblings. Daniel, a lawyer who specializes in divorce cases, remains close to his sisters, twins Felicity and Harriet, but his family background and his experience with divorcing couples have left him cynical about love: “Love was a chocolate box of heartbreak and disasters.” He has no interest in a long-term relationship. However, when a leggy beauty who runs in Central Park each morning with her Dalmatian attracts his attention, he is determined to meet her. To facilitate that meeting, he borrows a German Shepherd that his sisters, owners of the Bark Rangers dog-walking service, are fostering. Daniel counts on the dog to break the ice, and his charm to do the rest. Unfortunately, although the dogs make friends immediately, the beauty is not so easy to thaw. Psychologist Molly Parker fled her native England in a storm of scandal, professional and personal, and immigrated to New York where she created a new life for herself. As Aggie, owner of the blog Ask a Girl and author of a best-selling book, she has achieved fame and fortune as a giver of relationship advice. But while Molly keeps busy with her writing and fills her evenings with activities ranging from cooking lessons to spin classes, she protects herself from emotional involvement, depending upon her traveling father, her neighbors and friends Gabe and Mark, and her dog Valentine, the main man in her life, to keep her from being isolated. Scarred by her mother’s abandonment and convinced that she is incapable of a healthy romantic relationship, she is frightened by the feelings Daniel evokes. Daniel allows Molly to think that the borrowed dog Ruffles, whom he renames Brutus, is his dog, Molly chooses not to tell Daniel that she is Aggie, the well-known relationship expert. Of course, these lies create problems when the truth is revealed, but the greater problem is Molly’s inability to trust herself to accept the love Daniel offers. 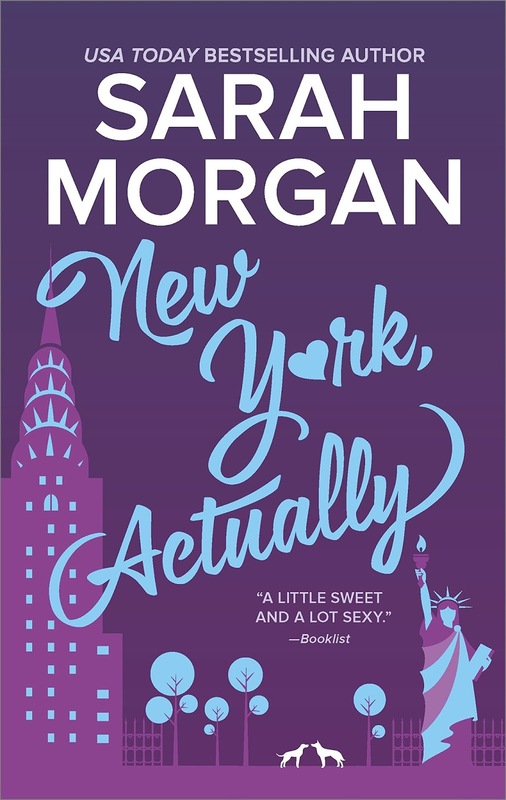 I loved the first three books in Morgan’s Manhattan-set series and rejoiced when I learned that she was continuing the series. Daniel, Fliss, and Harry are all minor characters in those books, and I suspected readers would see more of them as the series moved beyond the initial trilogy. Since I think Sarah Morgan is one of the best and most consistent contemporary romance authors, my expectations were high. I admit New York, Actually was a disappointment. I loved Daniel--despite his near-stalkerish behavior. He is a charmer, and his exchanges with his sisters (particularly Fliss), with Molly in their early meetings, and with his secretary were all delightful. And Daniel’s relationship with Brutus was one of my favorite parts of the book. Because the reader knows about his difficult father and the role Daniel played as family protector, it is easy to sympathize with him even when his choices are not the best. But I found Molly less sympathetic. Her decision to leave the scandal behind was reasonable, but for a psychologist to be so filled with self-blame and convinced she was a disaster at relationships was a hard sale. 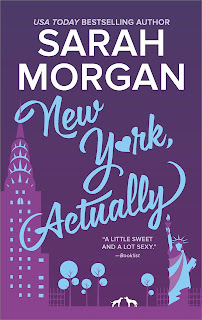 New York, Actually is not a bad book, and I didn’t hate it. But it does not measure up to Morgan’s usual excellence. Nevertheless, the Knight siblings were enough to keep me invested in the series, and I am series addict enough to enjoy appearances from leads in the first books. Final verdict: I give this one a recommendation with reservations. It offers an entertaining few hours, and it does succeed in leaving the reader eager for more of Fliss and Harry. Fliss’s book, Holiday in the Hamptons, a reunion story set for release on August 29, is next. I’ve read it already, and it is a winner. I think Molly's reaction doesn't work in part because the incident she is fleeing seems so unlikely and the public reaction seems VERY implausible. I too was disappointed.